Ever heard of a live wedding painter? We hadn’t either until we met Sam Day at the Wedding MBA in Las Vegas last month. Can you imagine instead of having a picture of your wedding on your wall, you can have an incredible piece of painted art hanging there? Sam is an amazing painter with an eye for detail. 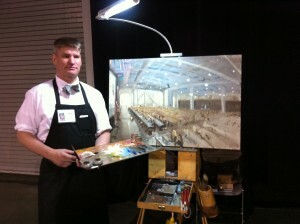 He sets up his canvas in the height of your wedding, then paints what he sees. Sam is a rare find as there are currently very few wedding painters in the world. His paintings are extraordinary and something we would have never thought of including in a wedding. Sam is an extremely talented, professional, and friendly guy who we’d recommend him to anyone looking for a WOW factor, or a breathtaking keepsake from their special day!